Good morning! I can't believe how quickly this week is flying by (or year for that matter). Since it is October now, I consider it officially the holiday season! After all, once Halloween comes around, Thanksgiving, Christmas and the new year just seem to be right around the corner. A few days ago, I was browsing Ali Edwards' blog as I do on a regular basis. I came across her post about Cole and was intrigued to go over to read about him here. Stories like this always touch my heart especially because I am the mother of a special needs child. My Sabrina does not have autism like Cole does, but she has had her own journey that has made life challenging at times. Yet when I read stories like Cole's, I realize that we are actually one of the lucky ones. Cole's mom, Mikki, has created an incredible digital scrapbooking kit available for a donation to her Walk for Autism effort. And believe me when I say that it is incredible! It took the better part of the morning for me to download it. I used Karen's Sweet Sunday Sketch #37 and a few of the digi papers from Cole's kit. I just printed each onto Epson matte presentation paper. The stars were punched from one of the printed patterned papers. 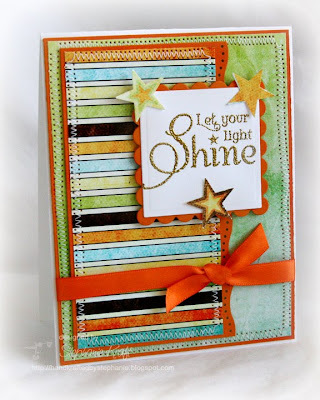 The sentiment is from Verve's, Starstruck, stamp set. Accessories: Square and Scalloped Square Nestabilities (Spellbinders), Dotted Wave border punch (EK Success), Star punch (Fiskars), Gold embossing powder, Ribbon, Foam tape, Thread, Sewing machine. Such a lovely card! I love the vibrant colors. Beautiful love the colors and the sewing is great! !